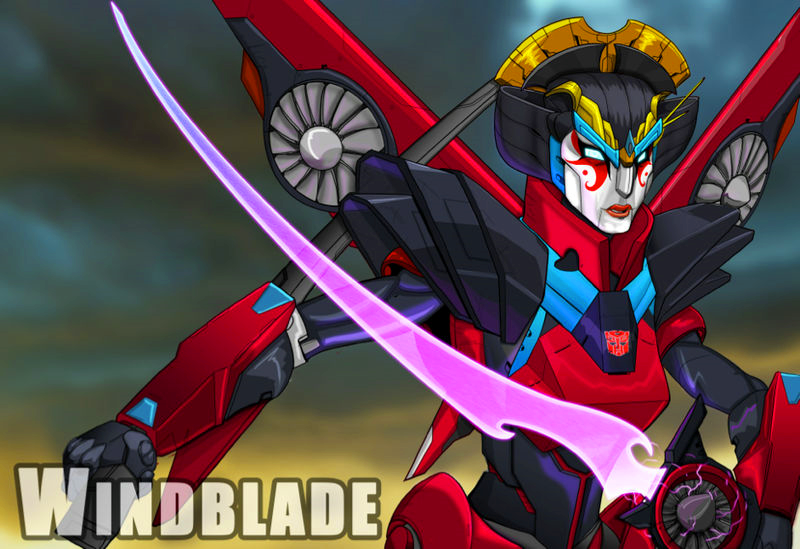 She's Fantastic: Transformers Generations WINDBLADE! The season of the fembot begins! This Windblade figure is an amazing addition to the sparse, but soon to be not-so-sparse collection of females in the Transformers toy line. A long-awaited Arcee and Chromia are due out in the next few weeks, but leading the pack is the mysterious and exciting Windblade. 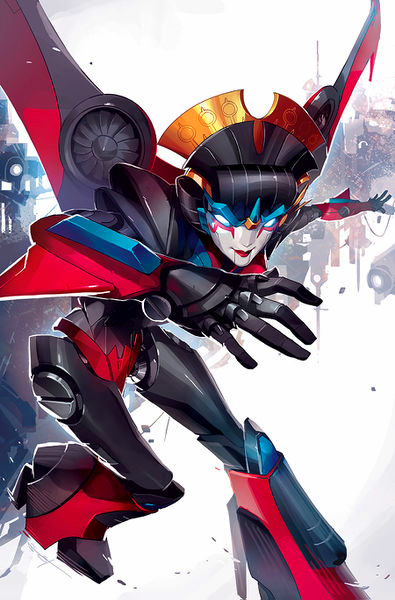 Windblade has the unique distinction of being the first official fan-created Transformers character. Her name, color palette, gender, vehicle mode, weapons, every single detail was determined by the fans. Adding to that interesting origin was her actual storyline which was unveiled in an unheard-of female-centric solo comic series. 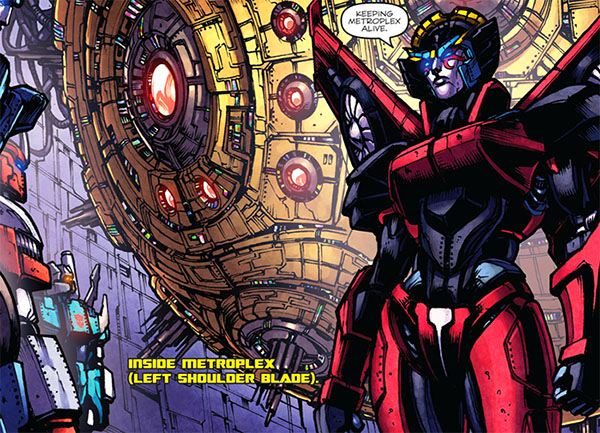 Windblade is Cityspeaker from Caminus. In her solo series, she is an outcast on Cybertron charged with communicating with the injured and dormant Metroplex. Maybe I just haven't read enough Transformers comics lately, but I was really impressed with the history and mythology unveiled in this story. She's a great new character that I already love. Her design motif is apparently based on feudal Japanese warrior women. That makes no sense for innumerable reasons. But I don't care because she's awesome. Okay. I feel a little sheepish. At this point in my original post I was complaining about the bulky black sword and how much of a disappointment is was that were didn't get the clear purple sword from the solicitation images. Then a reader asked if I was going to try removing the scabbard. D'oh! I'm leaving the original pics of her brandishing her "threatening" looking scabbard just because they make me laugh now. Her poseability is great. She has excellent wide "high heels" which really keeps her balanced in any crazy position you can come up with. Okay here's the real sword. The scabbard can mount to either hip via a simple tab-and-hole system. The unsheathed sword is such an improvement. The gold fan mounted behind her head is a removable weapon. It takes a lot of effort to remove it, but it definitely wiggles free with a little effort. This figure will have a Japanese variant released by Takara next year. The most notable difference seems to be a "red bikini" design and red deco on the wings of the Takara version. It should be noted that her wings can easily be folded back for a different front view in robot form. I never have too much to say about robot modes, but it's really nice to have a jet for once. 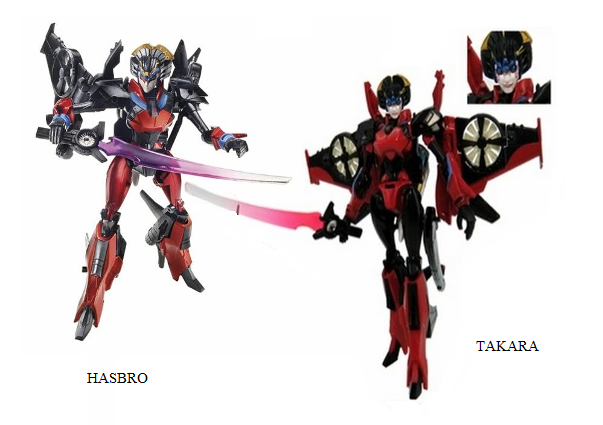 Here is Windblade with the Transformers: Prime - Robots in Disguise - Deluxe Arcee. And here with the Transformers: Prime - First Edition Deluxe Arcee added. Very cool! Iv been keeping an eye out for her but havent seen her in stores yet.I never saw Deluxe Arcee in stores so Im hoping I get lucky and find Windblade. I've been looking for her constantly, too. Then on Monday I saw her in TRU, Tuesday I saw her in Walmart, and Wednesday I saw her in my LCS. I don't think you'll have any trouble finding her. Did you pulling the sword or if the scabbard? Well I certainly feel silly. No, I had no idea that was a scabbard. I took new photos and added them above. Thanks for the heads up!! Haha glad I could help you enjoy an already awesome figure even more! I have pretty much halted my Transformers purchases but she is super tempting, might also get my wife into Transformers a little bit more too. haha. As ridiculous as it seems, I really dig the Japanese warrior aesthetic/ Might have to try and find this one too! She's a great character and a great figure. I've been seeing her regularly at TRU and Target, I think the initial wave of scalpers is done with her. Good luck!